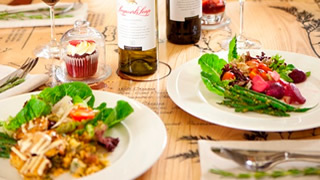 The Rotisserie at Leopard’s Leap Wine Estate is a new and exciting lunch venue just outside the village of Franschhoek. In our food offering at the Rotisserie, the focus is on relaxing, family-orientated enjoyment, exciting and occasionally experimental, exposing our visitors to interesting ways of exploring our wines in a culinary context – uncomplicated and slanted towards fresh and seasonal food. Our most popular attraction at Leopard’s Leap Wine Estate is our Rotisserie-based lunches, with every detail taken care of by Chef Pieter de Jager. The tempting offering of the Rotisserie includes a variety of tender, juicy meats from a state-of-the-art Rotisol spit, complemented by a selection of side dishes from our Harvest Table. As an extension of the food offering at Leopard’s Leap, a variety of innovative wine cocktails are served – delightful as adventurous dessert alternatives or simply for sipping on the veranda, watching the sunset over the Franschhoek Vineyards. Food lovers wanting to fine-tune or expand their culinary skills are invited to take part in a programme of cooking classes conducted by Leopard’s Leap in-house chef, Pieter de Jager and visiting local and international chefs. Staying seasonal and topical, the programme covers a wide spectrum of food types and cooking methods. Classes are presented in the state-of-the-art kitchen at Leopard’s Leap. Each student has his/her own cooking station. Duration is approximately two hours per class.